As a search engine, nobody's been able to beat Google at finding Web pages relevant to your keywords. But Google isn't very personal--it doesn't know the social networks you're a part of, and it doesn't necessarily remember the particular subjects you're interested in. A new breed of Web 2.0 services and applications launched at the DEMO 09 conference--an annual meeting promoting cutting-edge technologies--aims to bring that kind of personal knowledge to new search tools in the hope that such knowledge will help you find the exact information you're most interested in. Some of the tools, like Ensembli and Primal Fusion, are Web services. Others, like Kutano and Evri, plug into your browser. Still others, like Sobees, are desktop applications. One of the best ways to build a successful Web business is to give people a service they already need, then build on that base. That's the approach of Xmarks, which is created by the same people who make the Foxmarks bookmark synchronization add-on. Foxmarks is actively being used on 3 million computers around the world, giving the service information on 600 million bookmarked pages. How useful is that information? My quick take is that it could be very useful. 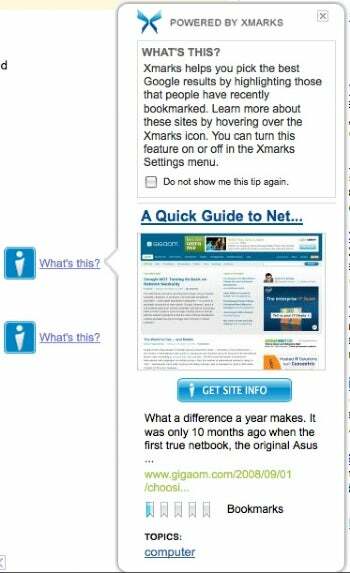 The Xmarks Web site lets you enter another site's name, and shows you what other people think of it. You can interact with Xmarks in two ways. If you go to the Xmarks site, you can enter a site name, and Xmarks will let you know what other people think of it. A rating scale tells you how often it's bookmarked, Xmarks users can review the site, and Xmarks will tell you about related sites. You can also install the Xmarks browser add-on (if you already have Foxmarks installed, the update will be pushed out to you soon). 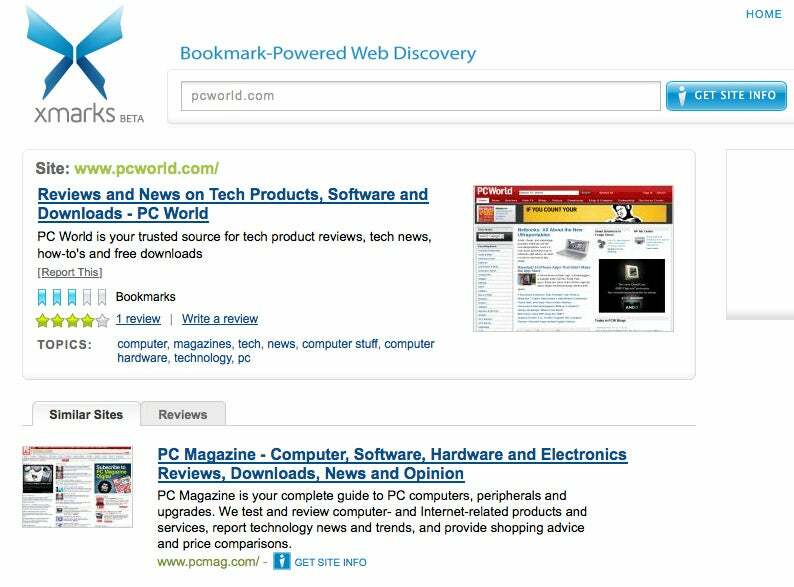 When you search at Google, Yahoo, or Microsoft's Live Search, Xmarks will look at the results and offer additional information about the three links per page that have the highest score--a combination of how many people have bookmarked the site, plus its "bookmark velocity"--how quickly people are adding the site to their bookmarks. That information looks as if it could be pretty handy in finding the most useful sites in your list of search results. The add-on also puts a small icon in the address box of your browser. Click the icon, and you see information for that page--its bookmark popularity and related sites. A number of services already search the Web for good deals on your behalf. Gazaro looks like it could be a solid addition by offering not just deals, but an analysis of just how good those deals are. Gazaro rates deals on a 1-10 scale. Gazaro, which is free and open to all, analyzes the price history of a product and tells you whether the price a site is offering is a really good deal or not, based on how prices have been in the past. In other words, $1200 for a particular flat-screen TV may be the best deal you can get now, but it's not a very good deal if the same TV was $1000 a month ago. With that kind of information, you may decide to wait for the price to go down again. 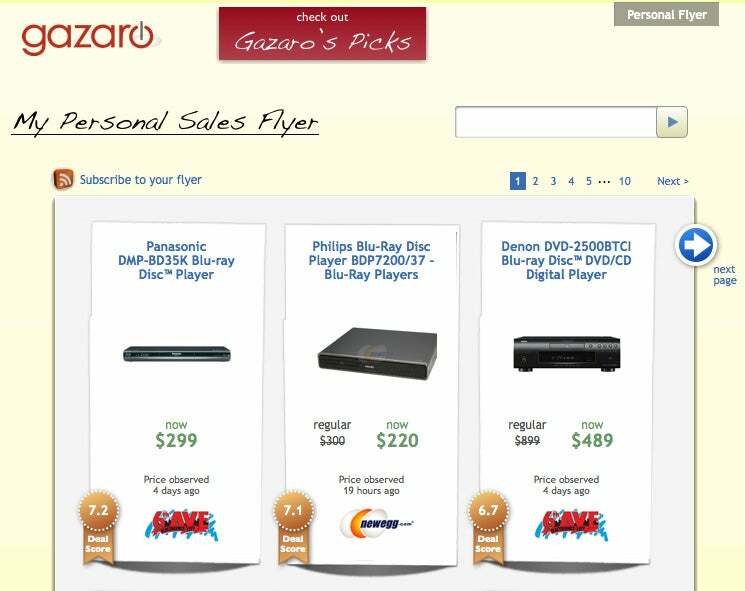 Gazaro rates deals on a 1-10 scale, with a score of 8 or 9 meaning buy it now. The temptation for a site like this, of course, is to rate all the deals as great to push sales and reap more commissions. My very fast look at the site showed lots of ratings that were 5 or lower, though, so I hope we can depend on them to resist grade inflation. Sign up for an Ensembli account (it's free), and the service will ask you what you're interested in. Type in subjects like tennis, and it'll give you a list of recent news stories. The interesting part comes as you work with the site over time: It keeps track of what types of stories you read or starred and gives you more of those. It's supposed to eliminate the kinds of stories you've deleted. Eventually, according to the developers, Ensembli should figure out that you're mostly interested in tips on how to play tennis better rather than in reports of the latest results at pro tournaments. An Ensembli results page for the search term "technology." 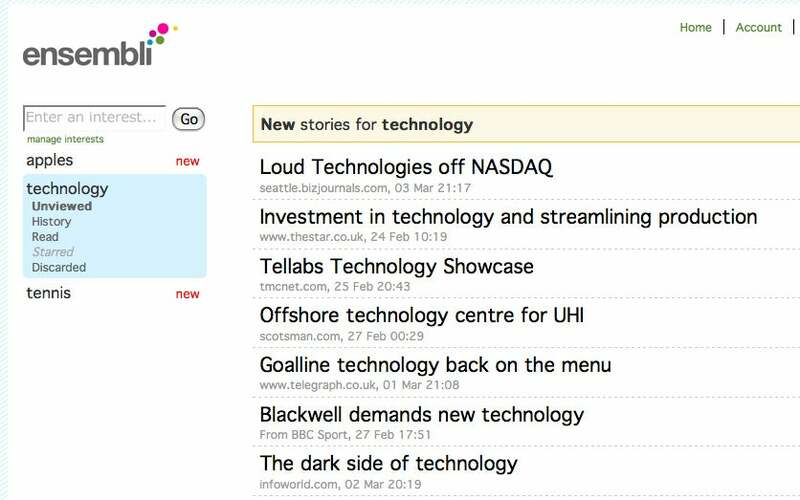 It's impossible to tell how well the system works without giving it more time, but the early search results seem slightly primitive: Typing in technology, for instance, only yields stories with the word technology in the headline, missing lots of stories that talk about technology, but don't happen to include it in the headline.